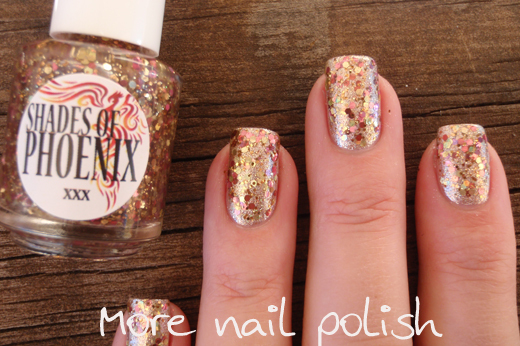 Here is the second part of the collection released yesterday by Teneil from Shades of Phoenix. 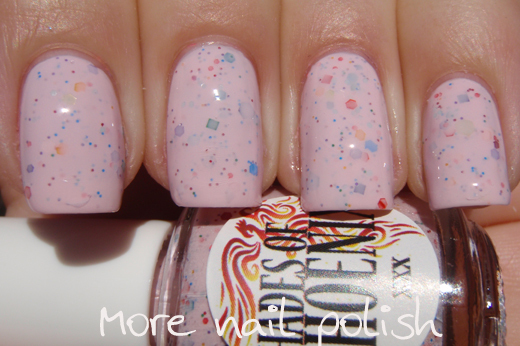 Chloris - a light pink creme base with multi coloured, multi sized square and hex glitters. 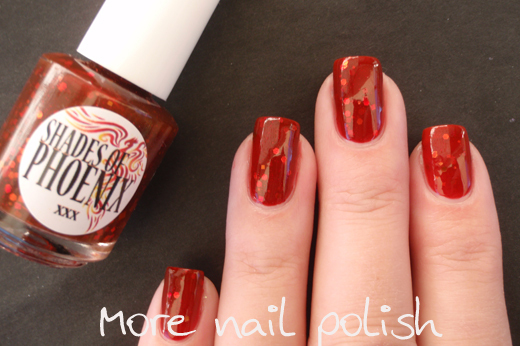 Three coats with Seche Vite. The Mythology: Chloris is the goddess of flowers. I found I needed to wait for each coat to dry quite well before applying the next coat, otherwise if the brush moved any of the lower glitters, they would leave gaps in the creme base. 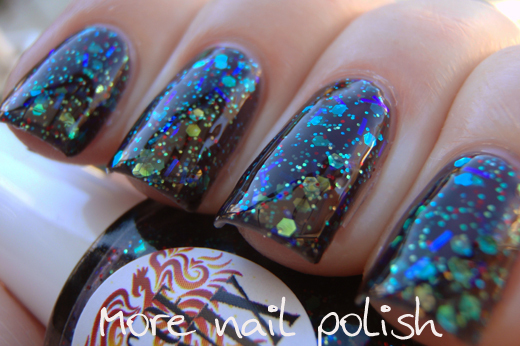 This polish looks kind of bumpy until you apply top coat, and then it looks smooth and oh so pretty. 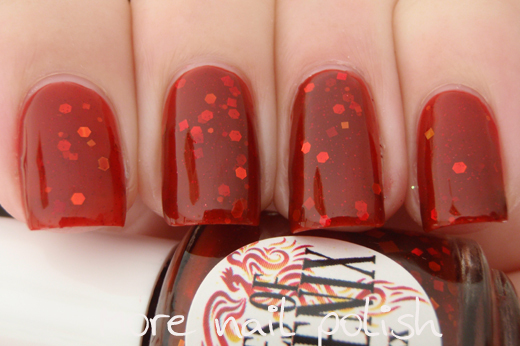 Enyo - a deep rusty red jelly polish with multi sized red, orange and yellow glitters, some matte and some holo, with micro red glitters that give it a slight shimmer. 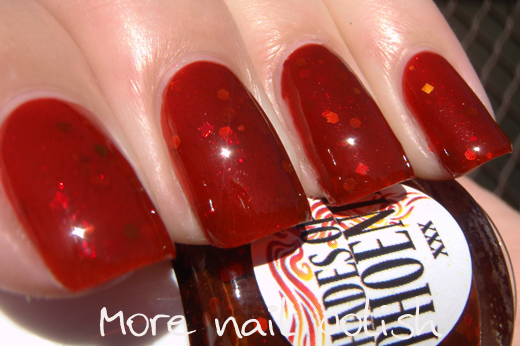 Three coats with Seche Vite. The Mythology: Enyo is the goddess of destructive war! 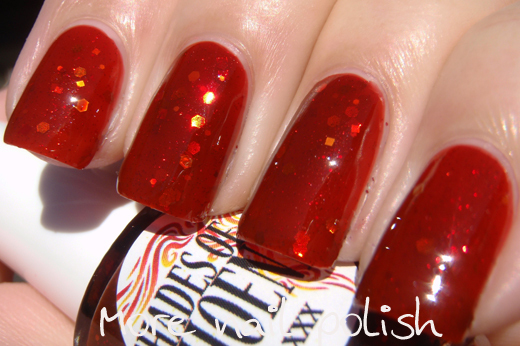 Formula on this was really great, smooth and easy to apply with just a scattering of glitters. 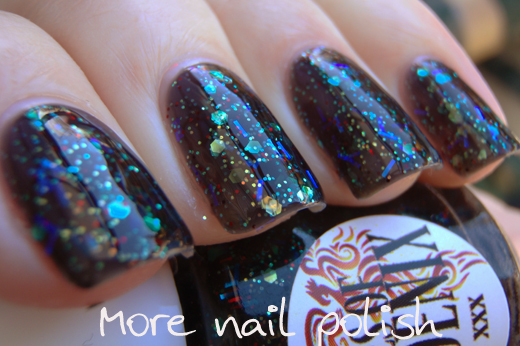 Eris - a black jelly base with various iridescent glitters colour shifting glitters, including red to gold and orange to yellow. There are also fine blue to purple iridescent bars and small bright red glitters. Three coats with Seche Vite. 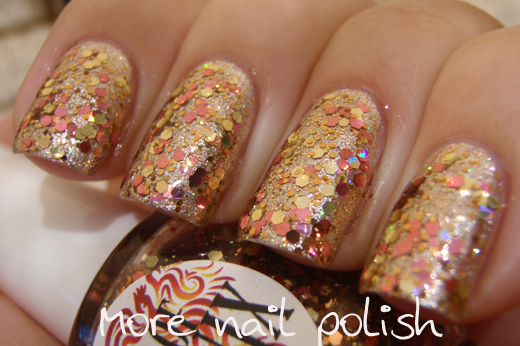 A little tricky to apply because of the bar glitters, but totally worth the effort. The Mythology: Eris is the goddess of strife, discord, contention and rivalry. 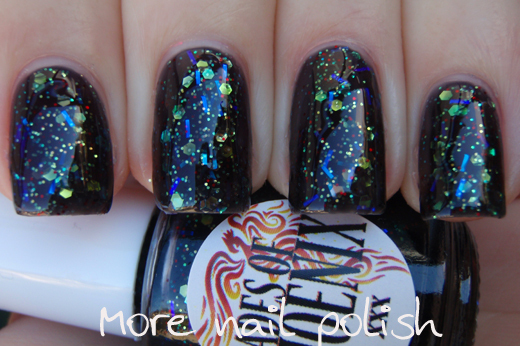 Hermera - This one is the only one that can't be worn on it's own, it's a glitter topper in a clear base. The glitters are copper, gold, rose gold and light pink hex glitters in various sizes and the sparkle projected from this is just gorgeous. 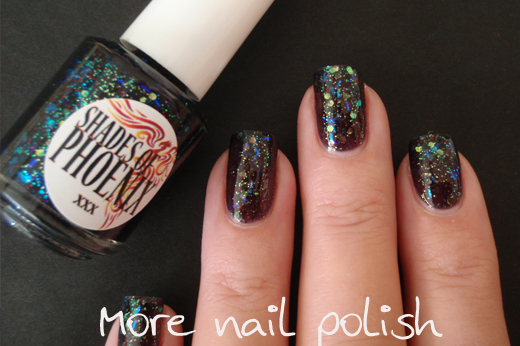 I layered two coats of Hermera over OPI Designer de better finished with Seche Vite. The photos don't show just how stunningly gorgeous this was in real life - of course it was gold too, so I'm absolutely completely in love with this one. The Mythology: Hemera is the goddess of day time. 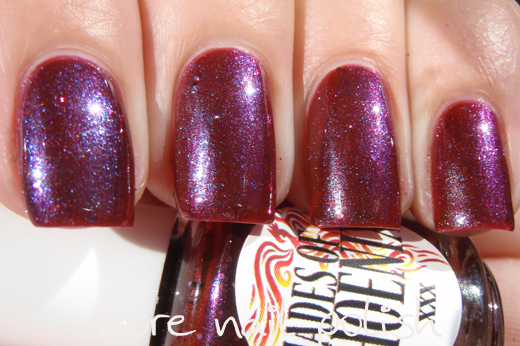 Persephone - this one is the limited edition polish and it has a deep plum purple base, with a blue/purple duochrome shimmer. There are also small purple glitters and lavender flakes in it. 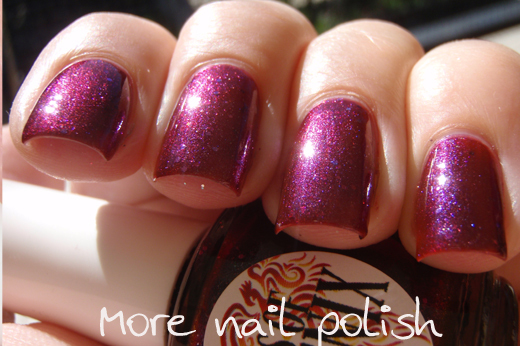 Three coats with Seche Vite. Enyo is so 3D! I love it.